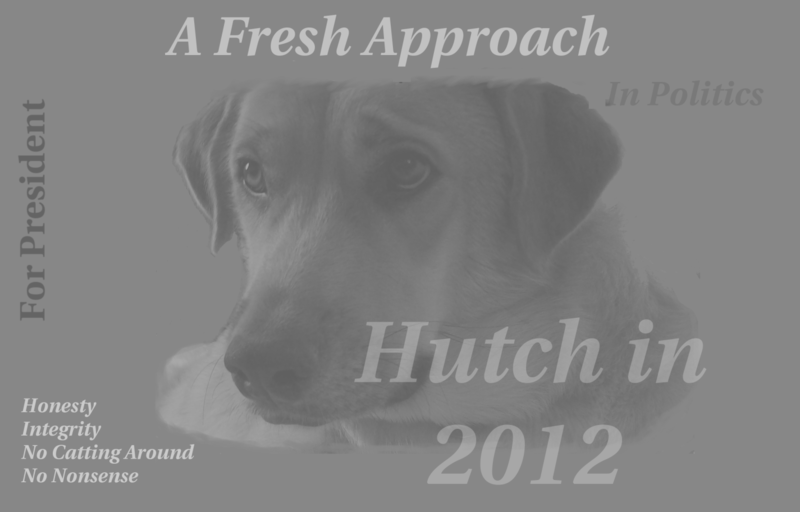 The very late entry into the 2012 presidential race by candidate Hutch of the Canis Lupus Party is being viewed with some skepticism by politial pundits. Regardless, the indefatigable, albeit unusual candidate expressed his usual optimism at a party rally of the Canis Lupus party headquarters near Raleigh, North Carolina. Speaking later from his home, he gave interviewers a bright smile, saying “Wut Wo!” – which seems to be a party slogan of sorts. Vice presidential candidate Starsky was as upbeat as the presdential hopeful who is his brother as well as his running mate. The aspiring VP politely deferred comment on the bulk of the interviewer’s questions. The last and (some say) most dubious platform plank promoted by the Canis Lupus Familiaris party has been drawing most of the skepticism from the pundits – but pollsters have already detected that many voters believe in the sincerity of the candidate.